Michael5000 continues his grouchy exegesis of that ubiquitous internet atlas of our times, Forty Maps that Will Help You Make Sense of the World. 36. "Area Codes in Which Ludacris Claims to Have Hoes"
Technical Merit: It is what it is. Artistic Merit: None ventured, none gained. Helps One "Make Sense of the World": This visual gag was created by some geography students some years back, when the song in question was popular, and as something to stick on the door of the grad student office it's fairly amusing. Then the press got hold of it, which was stupid. Now it's still being flogged at us a decade later, as a delightful little comic surprise on this list of maps that will help us make sense of the world. Well, whatever. 37. "Where 2% of Australia's Population Lives"
Technical Merit: Adequate but misleading. By adhering strictly to the boundaries of political divisions, it substantially underestimates the wide open spaces of the Australian countryside. Especially in the north, a lot of the larger political units will only have a significant population in a single town. Helps One "Make Sense of the World": Why say it on a map, when you can say it in poetry? 38. "The Longest Straight Line You Can Sail on Earth"
Helps One "Make Sense of the World": Depends on how you look at it. In terms of what the map tells us it's telling us -- the longest straight line you can sail on Earth -- it's all fine and good, but who the hell cares? On the other hand, maybe what we're really supposed to get out of the map is a greater appreciation of the idea of a Great Circle Route, and for that this map might lead to an interesting conversation. As part of that conversation, however, I'd hope somebody would bring up that "straight line" is not an unproblematic concept. The line shown here is one defensible concept of a "straight line," but so is the directional bearing that ultimately spirals towards a pole, and so, more than either, is the line that you can not sail, since it immediately begins rising up through the atmosphere, tangential to the spheroid surface of our beautiful blue planet. 39. "Map of Europe Showing Literal Chinese Translations for Country Names"
Technical Merit: A childlike projection with strikingly inept text overlay. Artistic Merit: None attempted, I hoped. Helps One "Make Sense of the World": No. I consulted with Dork Emeritus fingerstothebone, who has a pretty good handle on the Chinese language, on this one, and she confirmed what I expected: these "literal translations" are just rough Chinese homophones for European country names. You can do it in English, too: "Hungary" means "I want food!" "Ukraine" means "You major piece of construction equipment!" "Ireland" means "Angry turf!" It's all very inane. 40. "Reversed Map with Southern Hemisphere on Top of Map"
Technical Merit: This is a reasonably well-made map. Artistic Merit: Having wacky, unconventional maps like this hanging on the dormroom or office wall appeals to a certain stripe of folks. 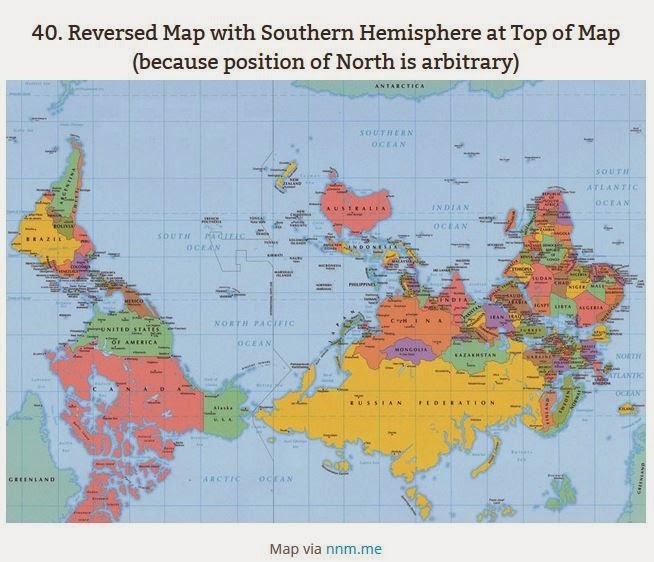 Except, the position of north is not really arbitrary at all. It really isn't. North is one of only two geometrically significant points on the Earth's near-sphere; the other is South, and together they mark the points where the imaginary axis of the planet's rotation breaks the surface. Is North an arbitrary choice among these two points? In the abstract, sure; but, since most folks live in the Northern Hemisphere (see Map #31) and since there is a bright fixed star, Polaris, that has given folks millennia of guidance on the locational front, North is really something of a slam dunk as the direction that would end up at the top of the page. Now of course there is a more academic sense in which, in terms of pure theory, "up" could be assigned any which way we wanted. To make that point, though, it is silly to just flip the world upside down. If you want to get arbitrary, get truly arbitrary: declare that the southernmost point of the island of Celebes is henceforth "up," and make your map accordingly. The result would be much more interesting and provocative than the usual pedestrian Australia-on-top business. Next Time Out: Oh hey, we're done! That Ludacris one really helps me grasp things. I'm sure he pulls out that map on the plane when he goes out on the road and needs places to stay. 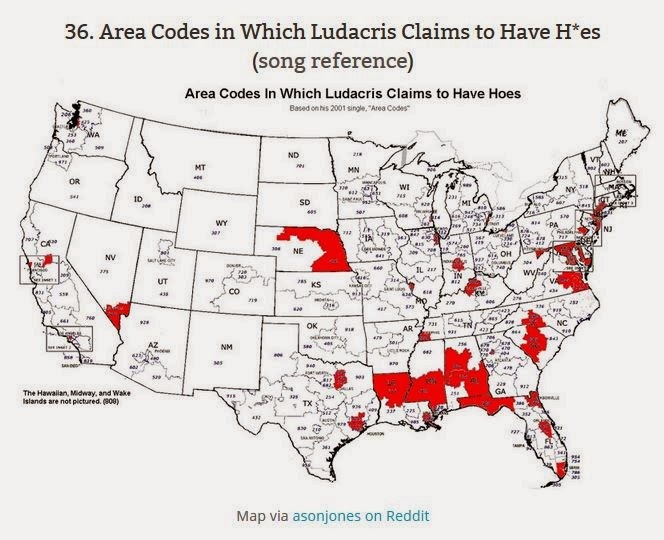 "Area Codes in Which Ludacris Claims to Have Hoes": I've seen this make the rounds a few times but I still have no idea who Ludacris is, and don't care to. I suppose it's supposed to be funny, but if you don't know the song it's just seems stupid. As for helping me make sense of the world, what a joke. Just looking at this map makes me feel like I'm wasting time better spent on...anything else whatsoever. 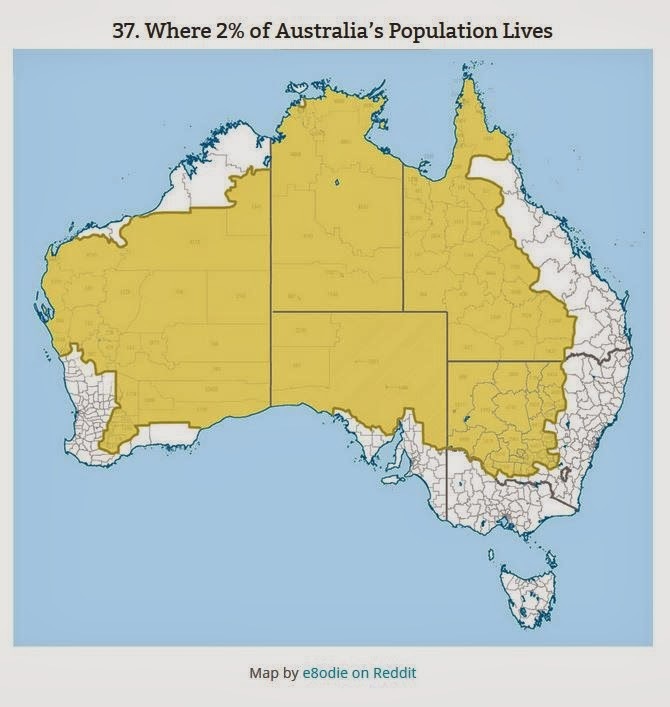 "Where 2% of Australia's Population Lives": Pullulate! 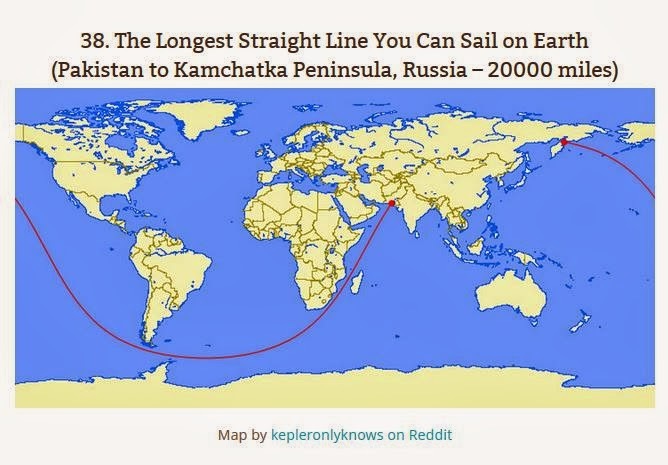 "The Longest Straight Line You Can Sail on Earth": Who the hells cares is right, but I have to admit when I first saw this map I felt obliged to see if I could find a longer landless great circle. I eventually gave up. I guess I get a kick out of useless geotrivia like this. 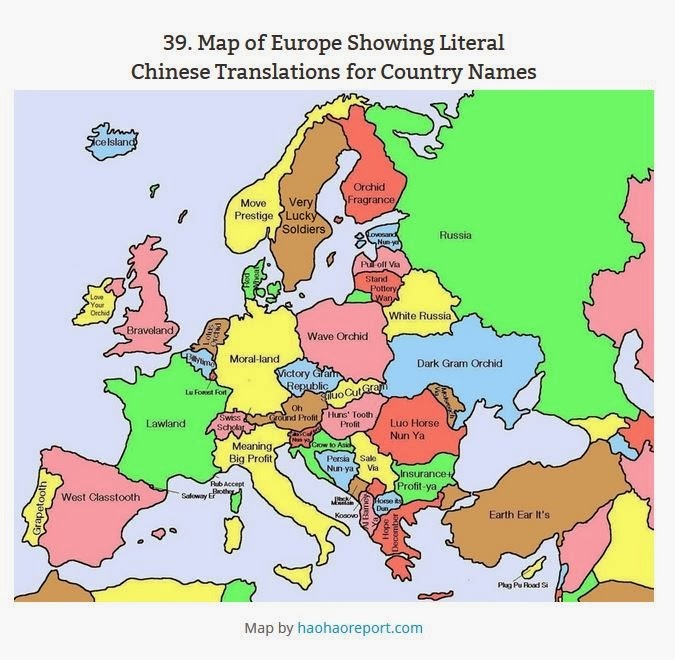 "Map of Europe Showing Literal Chinese Translations for Country Names": Yea, I thought it was kinda fun at first, until I realized it was barely accurate at best. Oh and the map itself is ugly too. Also, I wasn't here in 2008 and didn't see that quiz. Looking now I totally failed to see Maine, Nevada, or Ohio. Even after seeing the answers it took me a bit to see how that was Nevada. And I thought I was good at those kind of quizzes! "Oh hey, we're done!" Aww...I mean, phew.